Lantek Integra Quotes is an advanced solution for companies who wish to optimize their relationship with existing and prospective customers. This system provides immediate access to all customer information, ensuring optimal communication and service. It also provides the necessary tools to achieve the main objective for the professionals involved in the commercial process – to sell! 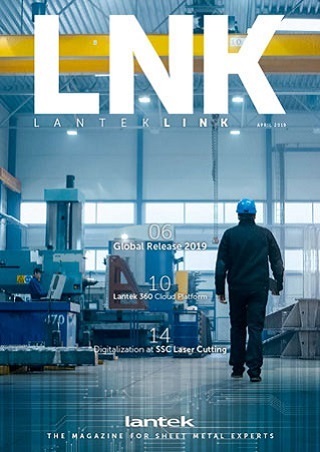 Lantek Integra Quotes is the perfect solution for the creation and management of quotations for sheet metal parts, profiles, and product structures in the sheet metal processing sector. Designed for professionals involved in the quotation process, it does not require advanced expertise in designing or nesting. The main objective of this system is to generate concise quotations easily. The system includes many tools to speed up this process. By means of an intuitive link to Lantek CAD/CAM nesting software, the system simulates a nest and automatically calculates the costs for each piece. Lantek Integra Quotes supplies all the necessary information to optimize contact with customers, and prospective ones, in a clear and precise way. Lantek Integra Quotes provides a quotation tool to calculate the costs associated with each assembly, part, or process. Once the geometry, material, thickness, and associated operations are defined, the system is able to calculate the estimated costs and is fully integrated with the Lantek CAD/CAM module. Lantek Integra Quotes includes cost calculations for different operations such as: bending, painting, welding, assembly, and more. The user is allowed to add extra costs for each option and/or quotation. Lantek Integra Quotes module is totally integrated with all of the Lantek Integra solutions. 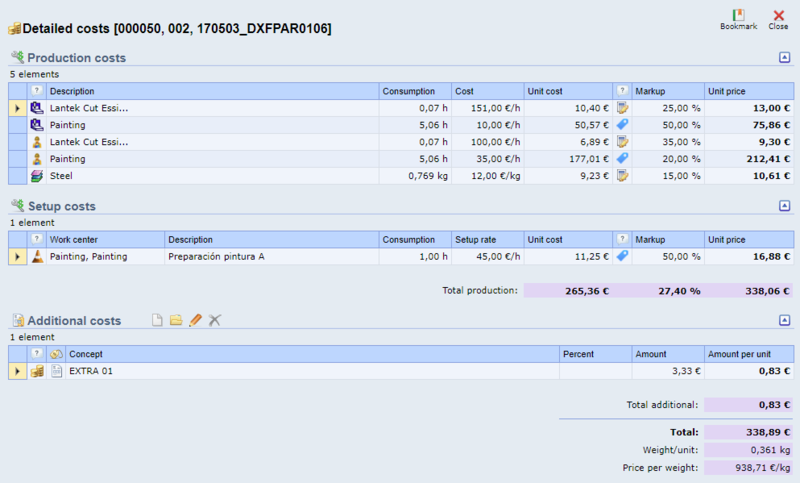 CRM module manages the traceability of all customer activities including sales orders, delivery notes, invoices, etc. This system allows the user to review the customer’s data and the customer’s credit risk before the close of any commercial activity. If the commercial activity exceeds the defined risk, the system offers other alternatives. Lantek Integra Quotes is fully integrated with Lantek CAD/CAM nesting software. The system allows a quote to be drawn, taking into account the cutting times for each part included in the nest. It is a very accurate cost calculation system as it enables real multi-part nesting and takes into account the values specified in machine configuration. 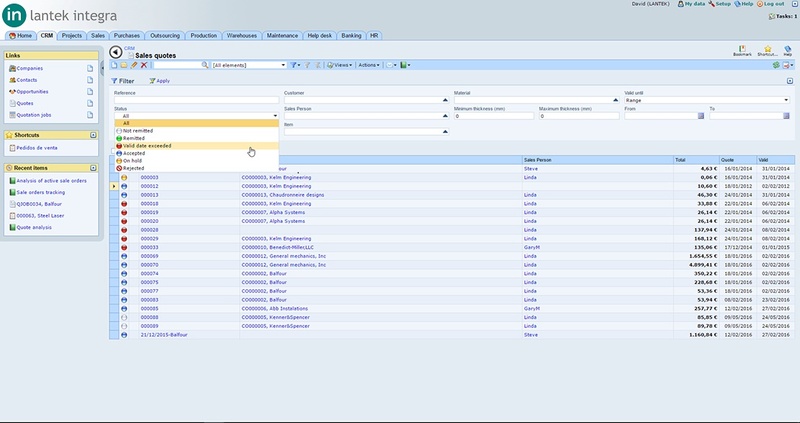 The quotation nest can be reused in the rest of the company’s processes. The Lantek Integra Quotes module is also integrated with the rest of the management modules of Lantek Integra. 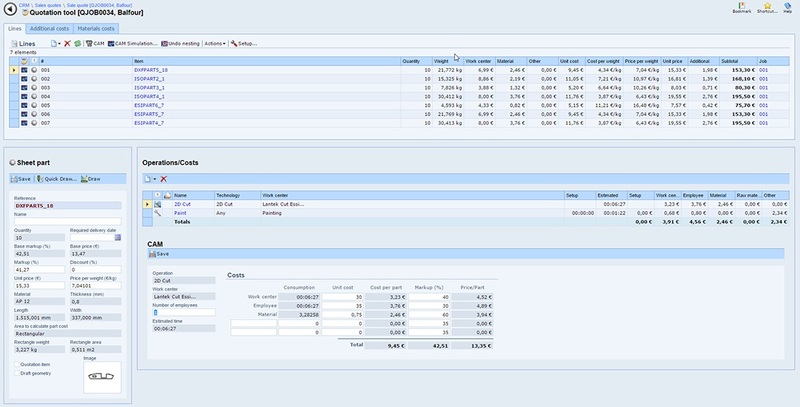 Once the quote is generated and accepted by the customer, the user may generate a sales order and transfer it automatically to the manufacturing department. 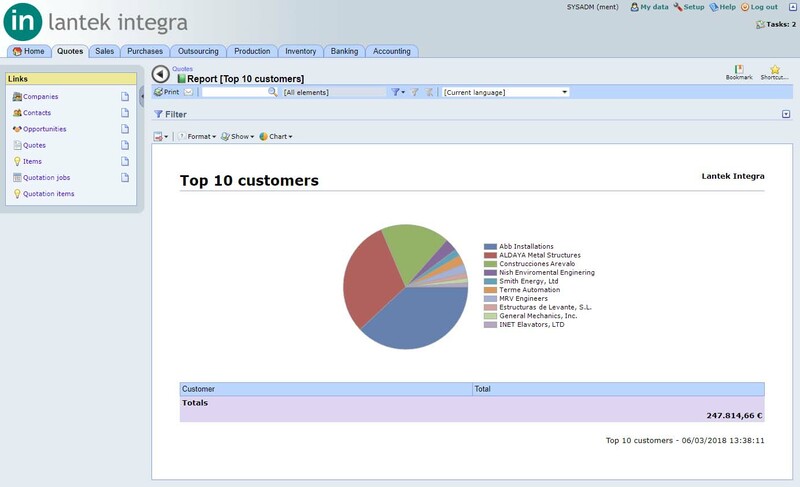 Lantek Integra Quotes allows powerful graphic visualization and analysis of all the customer contact and sales data. Activity and trend can be easily identified and monitored. The system renders a record of all quotes generated. The user can retrieve a quotation at any time, modify the data, and create a new quotation in just a few seconds.